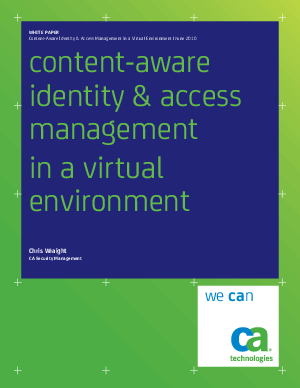 CA Content-Aware IAM helps you respond to the key IT drivers above. It helps to automate identity-based security processes (such as user provisioning, entitlement certification, etc. ), which increases efficiency and reduces IT costs. It strengthens security and reduces risk. It helps simplify compliance and reduce audit effort and costs. And, it enables you to more quickly deploy new online services and applications, thereby increasing your business agility so that you can respond quickly to market and competitive events. It provides you the control you need to confidently move your business forward.